So let me be very clear about one thing: We have a serious interracial violence problem in this county involving blacks and Latinos. Some people deny it. They say that race is not a factor in L.A.’s gang crisis; the problem, they say, is not one of blacks versus Latinos and Latinos versus blacks but merely one of gang members killing other gang members (and yes, they acknowledge, sometimes the gangs are race-based). But they’re wrong. The truth is that, in many cases, race is at the heart of the problem. Latino gang members shoot blacks not because they’re members of a rival gang but because of their skin color. Likewise, black gang members shoot Latinos because they are brown. Mayor’s son questioned in car theft case. An unidentified person was detained at Mayor Ron Beilke’s home Wednesday as part of an auto theft investigation, authorities said. Beilke said deputies questioned his 17-year-old son, who visited the same house as Sonny Costello, a 19-year-old transient, who is accused of stealing a 2002 Chevy Suburban on Tuesday night. Monrovia plans outside investigation of claims against PD. MONROVIA – Police Chief Roger Johnson said Wednesday that an outside agency would investigate sexual harassment allegations contained in a lawsuit filed against a Monrovia police officer. Rudy Ramirez, 25, a former Monrovia jailer and member of the Monrovia police Explorer program, filed the lawsuit last month. He claims Sgt. Dan Verna sexually abused and harassed him beginning in 2000 while he was a minor until November 2006 when Ramirez was terminated by the department. “Any of these allegations are going to be reviewed by a law enforcement agency independent of the Police Department to determine if there’s been any wrong-doing,” Johnson said. To bolster claims in his lawsuit, Ramirez states that Verna helped a suspected gang member, Salvador Parra, get released from Monrovia city jail on two occasions in 2006. Sheriff’s officials on Wednesday said a deputy saw Verna and Parra in 2006 inside of a parked car in Fish Canyon. On patrol May 2, 2006, Deputy Mike Silva spotted the pair, authorities said. When he saw a gun in the car, the deputy detained Verna and called for backup, said Los Angeles County Sheriff’s Department Capt. Richard Shaw. Man shot and killed in Hacienda Heights. Police responded to the 1100 block of Finegrove Avenue to reports of shots fired around 9:50 p.m., according to Deputy Aura Sierra of the Los Angeles County Sheriff’s Department. They found a Latino man, 30, with multiple gun shots wounds in his torso, Sierra said. CHiPs OIS follow up; woman identified. Two CHP officers patrolling the eastbound 10 Freeway just after 11 p.m. initially noticed the woman as she passed them in her car, driving at a high rate of speed, Dolson said. The officers thought she might have been under the influence, so they pulled her over at Hellman and Garfield avenues, just off the freeway, Dolson said. When one of the officers approached the vehicle, the woman pulled out the replica handgun, prompting the officer to fire one round, he said. The fake handgun was later recovered at the scene, said Los Angeles County sheriff’s Deputy Oscar Butao. BALDWIN PARK – A spree of violence culminated in the drive-by shooting death of a Baldwin Park teenager in broad daylight Saturday. The shooting victim, described as a 16-year-old Latino boy, was walking eastbound on Illinois Street between Kenmore Avenue and Idaho Street about 3:47 p.m. when a black, 1980s model sedan drove up and its occupants opened fire, said Los Angeles sheriff’s Homicide Detective Jonas Shipe. “He was struck multiple times and died at the scene,” said Shipe, who refused to identify the victim until detectives spoke to his next of kin. “It was a straight-up gang thing,” said Shipe, adding the dead teen was affiliated with a gang. The victim, who was identified by residents as Ruben Chavira, had been on his way to visit his girlfriend at her home in the 3800 block of Idaho Street when he was shot, said the girlfriend’s sister, Veronica Martinez. First of all, the bookstore was City Lights on Vermont in Los Feliz. Great bookstore — very tiny — but an ecclectic selection of interesting titles. I’ve seen several interesting authors stop by to do readings and signings. It reminds me of the old Vroman’s. As for the magazines, the graffiti mag was titled UP. 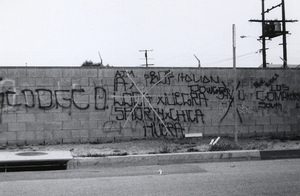 I just looked at it again and after reading the article with the LA graffiti photos, I realized the photos were all shot in the 1970s by a guy named Gribble (not Dale Gribble from King of the Hill). Several of the photos are posted on Flikr here. There’s also an interview with Gribble on Handselect. Gang investigators with the Los Angeles County Sheriff’s Department have arrested a Lynwood city official on suspicion of felonies, including being an accessory to robbery and possessing a stolen handgun, a department spokesman said. Autra Adams, special assistant to the Lynwood city manager, was arrested at her home Thursday morning, said department spokesman Steve Whitmore. 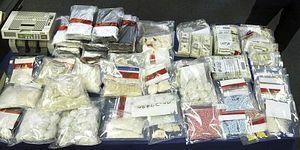 According to a law enforcement source familiar with the investigation, Adams was arrested in connection with a case targeting the East Coast Crips street gang. 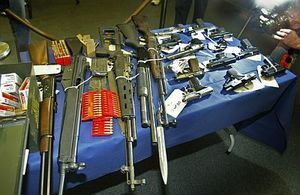 Several members and associates of the gang were wanted on charges including murder, attempted murder of a police officer, bank robbery and weapons violations. When sheriff’s gang investigators served search warrants, including one on Adams’ Long Beach home, they found a loaded 9-millimeter handgun and photographs of Adams with armed gang members, the source said. Here’s a link to the Lynwood City Manager’s page. *And here’s a link to the Lynwood watch blog, with a screen capture of Adams’ inmate page from the sheriff’s department. Speaking of deception, lies and other malfeasance, reporters Tania Chatila and Jennifer McLain unveiled their column today going after all that and more. Dont’ forget to visit their Leftovers at City Hall Blog for all the daily dirt. Chuck Hubbs, who was the night city editor at the Los Angeles Herald-Examiner when I was a copy boy there, always had me running weekend casualty counts. I’d rip pieces of printer paper from machines that spit out copy from the Metro Wire and City News services and run them back to Chuck so that he could compile a daily body count for an inside page. Some weekends were slow with one or two slayings. Others seemed quite busy; with eight, 10, even 15 killings. I wonder how many of those even got solved? This past weekend undoubtedly would have qualified as a slow one. And yet, it could have been quite deadly. Young men were injured in shootings in Whittier and Pico Rivera. A few other teens might have taken bullets in Baldwin Park. But somehow they were luckier than Jose Perez, 16. The Baldwin Park High student was shot to death talking to a friend outside a home in the 5000 block of Maine Avenue Saturday night. By my count, Perez is the second student from that high school to succumb to gun violence this school year. That seems awfully high. In November, Baldwin Park High student Luis Estrada, 14, and his father Pedro were gunned down by four attackers in front of their home in the 4000 block of Downing Avenue. Three teens, all former Baldwin Park students, have been arrested in the case, officials said. A fourth remains at large. Gang rivalry apparently motivated the incident. As they did in the Estrada case, school administrators promised Monday to provide grief counseling to anyone who needed it at Baldwin Park High School. “The school will of course do something for the students who need the services,” said Lynne Kennedy, associate superintendent for student achievement in the Baldwin Park district. Although there is absolutely no indication that Perez had gang ties, it’s pretty clear his attackers used gang tactics. Witnesses said the men drove slowly north on Maine Avenue. They flipped a U-turn, drove up to Perez and opened fire. Because Perez had only just enrolled at Baldwin Park, and was killed on a Saturday night far away from campus, Kennedy claimed the slaying reflects more on the community at large than on the high school. Kennedy also claimed that there is no gang problem at Baldwin Park High School, even as she pointed to the city’s tenacious problem with three notorious groups. This morning (as I do most mornings) I know I’ll drive along Puente Avenue past Baldwin Park High on my way to work. I’ll watch the kids pass and wonder who is going to college? Who is going to Iraq? Or Afghanistan? Who is going to get married, settle down in town and raise another generation of students? I’ll have another question on my mind this morning though: Who will be the next name in my casualty count? She added that Flores has shown no compunction for his crimes, as he demonstrated by assaulting a sheriff’s deputy before the trial began and ordering a “hit” on a deputy during the jury selection process. Flores sat silently and motionless as the verdict was read, Hanisee said. He showed no reaction at all, she added. Defense attorney Pierpont M. Laidley said he believes negative feeling toward gang members in general caused jurors to overlook problems in the prosecutions case. “That’s why I feel my guy was lynched,” he said. 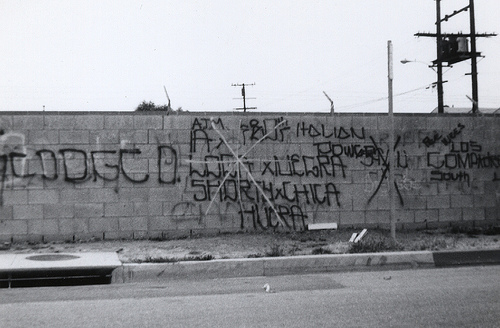 For Azusa, the case marks the end to a violent chapter in which a handful of gang members called the “trigger clique” terrorized the town with a series of shootings, killings, robberies and hate crimes targeting blacks. Their rampage lasted from 1999 to 2004. Besides Flores, seven other Azusa 13 gang members were convicted of the crimes and sentenced to lengthy prison terms — five of them in one 2004 trial. Azusa’s experience shows how a few gang members following directives from the Mexican Mafia prison gang can become a public policy issue, scaring residents while taxing the budget and police resources of an otherwise peaceful town.